I just finished this wet, juicy painting of our Sadie Wonder yesterday afternoon, and have been trying to photograph it under various light configurations, to eliminate the reflective shine off the wet, thick paint, all morning. I’ve come to the conclusion that it can’t be done. I’ll try again when it’s dry. It was painted with a very limited palette of Cadmium Yellow, Cadmium Red, Alizarin Red, Ultramarine Blue, Phalo Green and White. This translates as a warm yellow, a warm red, cool red, cool blue and blue green, which is a “warm” color in most circumstances. I’ve always used a limited palette, but this is even more restrictive, and therefore, freeing! Proof positive that, indeed, less is more! I hope the rich colors in the painting comes through on your screen. There was no tube black used in this painting, and all the colors, being mixed from the primary colors listed above, have a beautiful harmony, from the brights to the rich neutrals. Sadie’s the leader of our Pack of Three Apsos, which now includes her son, Whyatt. I’ll get a painting done of Whyatt soon, so you can see what a delightful fellow he is, too. But tiny Sadie, who weighs all of 11 pounds, is definitely the Alpha Female of this pack. She keeps order according to her own set of canine laws. No one argues with her, either. Truth be told, the humans of the household are under her command, too. Other than asking her to sit for treats, she pretty much orders us around, too. We do her bidding: opening doors, going for “pokes”, playing “tricks for treats” and even, once, taking them for a car ride, just because Sadie said so. She’s a benevolent leader, however. Generous with kisses and cuddles. She’s just about the sweetest little dog I’ve ever known, and just look at those eyes! A Champion and mother of Champions, she’s Top Dog around here. If you want to see a funny little video of our Apsos in Action, go to http://www.zeketheapso.us/ and click on The Zeke and Sadie Show on the left side of the front page. Then, click on "Apsos help make "their" bed" on the little videos. It'll give you a good idea of how apsos can take over your life, in a wonderful way! 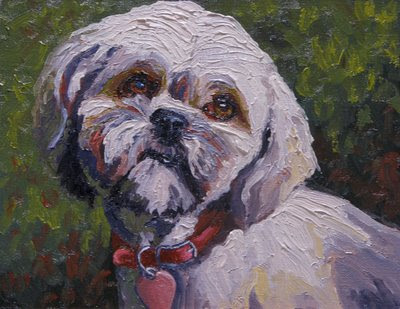 This 8 x 10 oil on archival linen board would sell for $160, if it were for sale, which it isn't. 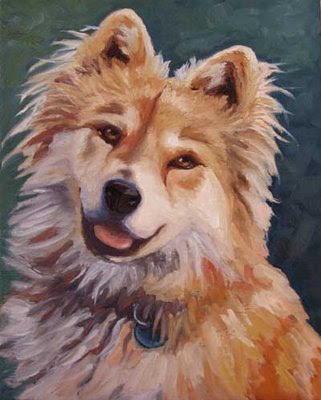 Happy to paint one of your beloved, though! 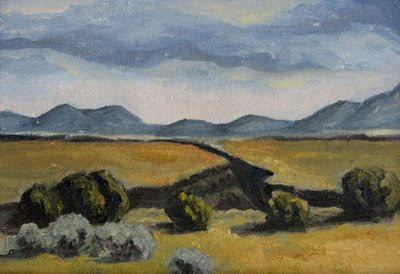 I recently took a workshop with a well-known regional landscape painter named David Schwindt. The workshop was held at the Starlight Ranch Artist Retreat and B & B which has wonderful accommodations and spectacular views. The colors this time of year are just delicious! This particular workshop dealt with strategies for painting the landscape indoors, and seven kinds of color contrasts, two vital elements in successful landscape painting, especially for those of us who don’t have many opportunities to go out in the field and do a lot of painting. 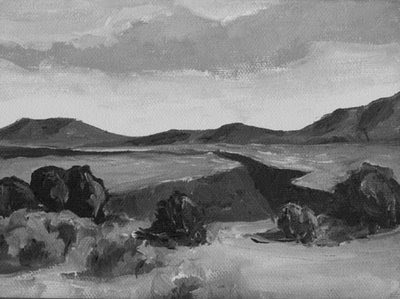 I painted this value study from a small (and not very good) photo I took several years ago of the Taos Gorge. The next day, I “translated” the value study into a color study. It was a good exercise. Both paintings are 5" x 7" oil on canvas board. Some kind soul found him out in the rain and took him to the humane association as a puppy. Somehow he received a diagnosis of “aggressive male” and the people who fell in love with the beautiful little puppy sitting quietly at the front of his kennel, while all the other dogs were barking like crazy, took him home, anyway. He was a one-man dog, playful in a reserved sort of way, and not much interested in toys, other dogs or most people. Wolf-life in appearance and manners, he was in his element camping with his people on the high bluffs of Northern New Mexico. Griz is now in his golden years, and recently met with a terrible accident while on one last camping trip. He’s at home recovering now, receiving all the love and attention he deserves and needs to complete his journey with dignity and respect for the many years of loyalty and friendship he’s so willingly given. May God bless your remaining days, Old Griz.